When you need towing you need it now! 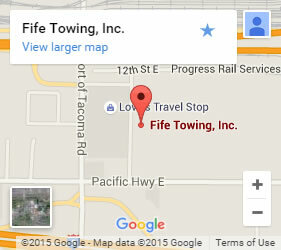 Fife Service & Towing offers the best commercial towing in Federal Way and many of the surrounding cities. We are a multi-generational towing company with over 65 years of experience in the business. We know everything there is to know about commercial towing. We can get you out of even tightest situations. You may only need help getting up and running again. We can help with that too. Our roadside assistance includes gas delivery, help with a flat, a jump start, or other ways you may need help getting back on the road. When those options won’t help, we offer affordable towing by certified professionals. 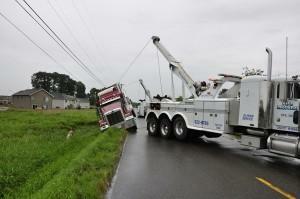 Our high standards keep us at the top of the list of commercial towing services Federal Way has come to rely on. We get to you right away and we treat you and your vehicle with care and respect. We have the equipment and know-how to handle load shift and cargo reloading. We are able to get heavy-duty vehicles and cargo out of any situation. Our 24-7 dispatch and wide range of service area makes us the premier option for commercial towing in Federal Way. We have a fleet of fully-prepared towing vehicles, including flatbed trucks and heavy-duty commercial towing vehicles and equipment. No matter the time of day or night, no matter what corner of our service area you are in, and no matter the sticky situation you are stuck in, we can help. When you need commercial towing in Federal Way, don’t be made to wait. We understand that time is everything when it comes to making commercial deliveries. We have what it takes to get your and your cargo back on the road without further damage. Call us for 24-hour, 7-day-a-week towing and roadside assistance and know that help is on the way! Contact us today for commercial towing in Federal Way and surrounding areas: (253) 292-6170.